Craving something cheesy, salty and carb-coma inducing? Well, look no further! This dish is like restaurant style mac and cheese taken to the extreme. It has pretty much anything you could ask for at the end of a long day – bacon, cheese, pasta, ham and even a little chicken for good measure. You will eat it, your kids will eat it, then you’ll all eat it again for lunch the next day because it’s just darn addicting (isn’t all mac & cheese?). Adapted from Chef in Training —-> head on over and check her out! Over medium low, heat cream cheese until melted, then stir in heavy cream, onion salt and garlic powder. Adjust seasoning to taste. Stir in 1 cup cheese until melted and smooth. In a 9×13 in. 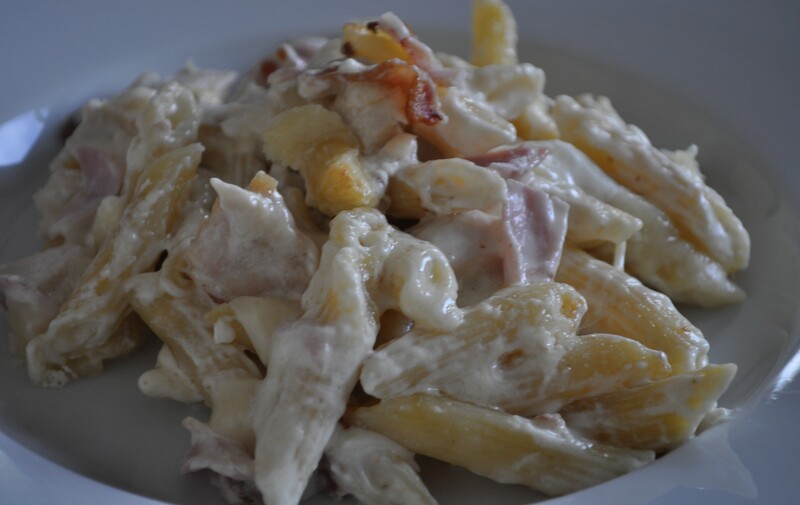 baking dish, combine pasta, cheese sauce, chicken, bacon and ham. Top with remaining cheese and breadcrumbs. Bake for 15 minutes, until hot and cheese has melted. Posted in Dinner, Recipes and tagged cheese, chicken, cordon bleu, Pasta. Bookmark the permalink.